This activity is a follow up to Consumer Reports Jr. In that activity, students tested different brands of facial tissue. In this activity, you and your students will determine which new product (or products) to test. Once you have chosen, you will need to purchase 3-4 different brands of that product and provide the tools necessary to test them. As a result, this activity takes place over several days and sessions. Once you have the list, you should narrow it down to two or three products, and ask the group to vote on which one you’ll test together. If you have the resources, you can assure them that you will test others in the future. Select the product you’ll be testing based on the vote. Can you find a new product to test, and determine which brand is the best buy? Ask the larger group to list the important attributes of the new product. Record the list on a piece of chart paper or a dry erase board. Ask the teams to talk together about which of these attributes is “testable”. For instance, if they selected microwave popcorn, they could test how many unpopped kernels remain after a designated cooking time; they could count the total pieces of popcorn per bag (tedious to do, but useful information); they could read the labels to determine fat and salt content; and they could pop several bags in order to determine how consistently the popcorn pops fully. But other attributes are not as easily “testable” in small teams, particularly “taste”. With only three team members, a taste test would not yield credible results. Instead, teams would have to conduct blind taste tests with a much larger group. 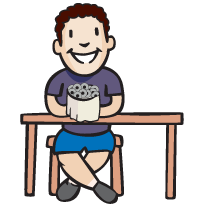 Another attribute with popcorn might be “greasiness” – also very difficult to test with simple materials. Have the teams vote on which of the listed attributes are “testable”. Use your judgement to select one or two of these attributes to proceed with. Once you have selected the attributes to be tested, ask the teams to develop their tests. What materials will they need in order to conduct their tests? Remind them that you have a limited budget, so they will need to be creative in deciding what materials they would like. Challenge them to create tests that use materials they can find around your afterschool center, or that they can bring in from home. Ask them to record the process for their tests on paper, and have them create a list of the necessary materials. Follow the same process you used in testing facial tissues in the Consumer Reports Jr. activity. Tell the teams that you have 3 (or 4) brands of the product to test, and show them samples of the product BUT DO NOT TELL THEM WHICH BRANDS THEY ARE TESTING. Point out that you have not told them the brands and ask them why they think you haven’t. If they don’t mention it, tell them that it is important that they not know so that they will treat each brand equally in their tests and not try to get their favorite brand to “win”. You are eliminating what is called “experimenter bias”. It may be tough to distinguish among the different brands—do what you can to keep them straight. It may be best to put duct tape, or blot out with permanent marker the brand names. You might also remove brands from their packaging and place them in blank packaging labeled ‘A’, ‘B’, ‘C’, or ‘D’. If appropriate, you can tape a sample from each brand to a piece of chart paper, or place them on a table, with each sample labeled ‘A’, ‘B’, ‘C’, or ‘D’ . You may also choose to simply hand the brands out one at a time and have teams all first test brand ‘A’ and record their results before you hand out ‘B’, then ‘C’ and ‘D’. While teams are designing their tests, your job is a critical one—older children may be able to design these tests fairly easily, but younger children will need your guidance. Feel free to ask them questions that will lead them to different experiments. Your other role is to make sure that teams are working well together—this activity requires a good deal of cooperation. Encourage teams to have a role for every member. After each team has designed their experiments and has begun testing, take a break and bring the group together to talk about what they have done so far. Have each team report about what they are testing and how they are conducting their test. As they describe their tests, ask them questions that help them think about how carefully they are testing. Ask them why it might be important that they test each brand exactly the same way they tested the others. Have teams go back to their experiments to finish their testing. Stress the importance of recording their results. Once all tests are done and teams have their results, ask them to assign a score to each brand for each test. The top performer for each test gets a ‘1’, second place gets a ‘2’, third place gets a ‘3’ and 4th place gets a ‘4’. If any brands tie, teams should AVERAGE the two scores…for example, if two brands tie for the best results for number of kernels left unpopped, one of them would have gotten a 1 and the other a 2…averaging the two yields a 1.5, so they should each be scored with a 1.5. Tying for 1st = 1.5; tying for 2nd = 2.5; tying for last = 3.5. Ask each team to share their scores and record them on a chart (figure 1). 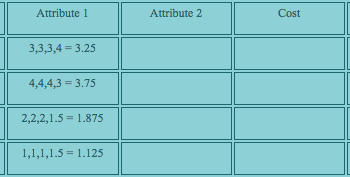 Notice that each of the team’s scores are recorded in the “Attribute 1” column, then the average is calculated. You can ask kids how to find the average of a group of numbers (add them together then divide by how many numbers there were), and maybe even ask them to determine the average themselves. In the chart above, Product ‘D’ is the winner (the lowest score), followed by ‘C’, then ‘A’ and then ‘B’ scored the worst. Do the same for each attribute. You can ask the teams to calculate the cost per cookie/kernel/bag of the 4 different brands, depending on the product you have tested, or you can simply write down the cost. Again, assign each brand a score from 1-4, with 1 being the lowest cost, 4 being the most expensive. In the “Total” column, find an average for each brand’s score—add up the scores for each attribute (including cost) and divide by the number of attributes. The brand with the lowest average score is the winner! Ask your kids to name all of the different brands they have heard of for the product you tested, and write them on a piece of chart paper as they list them. Tell your students which 3 or 4 brands you bought and ask them to guess which is which, based on their tests. Reveal the winning brand. Were they surprised by the results? Take this project even further by testing more products and asking your students to develop a mechanism for sharing their results with their peers, their families and even their community. A newsletter could be sent home to families; a blog or website could share the results with an even broader group. A family event in which students act out “commercials” for the tested products…there are many ways in which this useful information can be shared. Work with teams as they think about designing their experiments. Some teams will develop tests right away, but some will need guidance. The longer they struggle, the more you’ll have to ask leading questions.